OhMyVera! A blog about all things Vera Bradley: Great Deal Today on the Throw Blanket and Large Duffel! Great Deal Today on the Throw Blanket and Large Duffel! Check your email for a discount code from Vera Bradley! My email titled 'A high five for the graduate..." had a $20 off a $75+ purchase (not all emails have the coupon), so I used it with promotion that is going on right now to get a Throw Blanket and a Large Duffel for $100, bringing my total to just $80! Plus you get free shipping on orders over $75, so I just had to pay tax for a total of $86. That is like getting the blanket for free! Wow you are lucky! I checked my email again to see if I had missed something--no coupon. 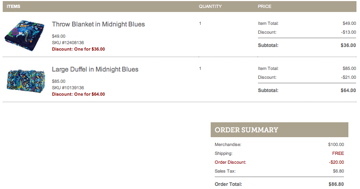 Too bad I want a MB tote before they are gone. So it looks like from your receipt you got MB duffel and towel--cute. I got the Large Duffel and Throw Blanket because they are on sale right now...you can get both for $100. i got one, in the email i use to order / register with! fun!